Hello and welcome to the third group post for the April Papertrey Ink Release! The new products you are seeing here will be available in the store at Papertrey Ink on April 15th at 10:00 EST. I am so excited about this post! I finally get to share my stitching project! Erin is releasing a whole bunch of new dies this month and they are so fun! I have been wanting some scallops, so I was so happy to see those, and there are clouds, a rainbow, and the sun, perfect for creating cute stitched scenes! So, I started with a 6 inch plastic yellow hoop. I really wanted a wooden one, but my options are limited to pretty much Wal-Mart living way out in the country, so I settled for the plastic one, and now I'm kind of glad I did, because I really like it! I stretched some blue fabric on the hoop, I cut out the circle of blue felt, and then ran it through my Big Shot with the sun and rays holes. I then stitched the blue piece of felt to the fabric. 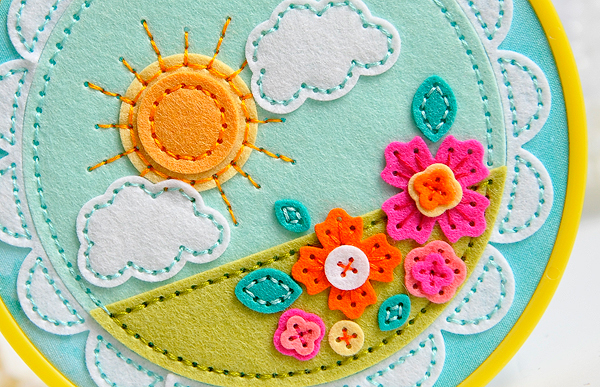 Next, I stitched the sun, clouds and ground. 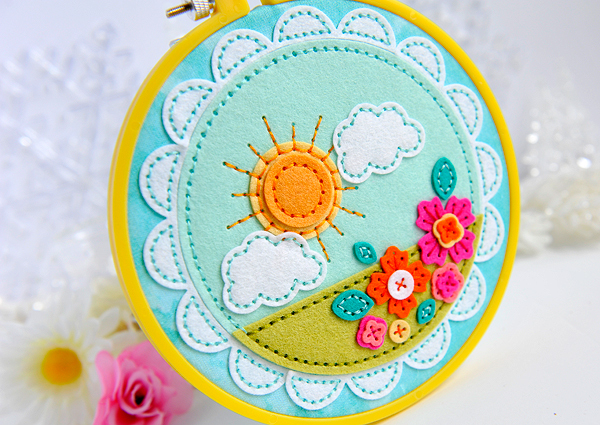 I added the smaller circle in the middle of the sun with the smallest of the Stitched Circle Dies. I then cut the flowers out with the Floral Cluster stitched dies, and sewed them down. I bought some felt glue the other day and I used that to glue the scallops around the edges, because I just knew that if I went to sewing that around the edge without gluing it or pinning it, I would end up with an extra scallop or not enough. That worked out real well. After the glue dried, I did the stitching around. This is how I finished the back. I cut the fabric about an inch and a half from the edge of the hoop, and did a running stitch around the edges. I then drew up the stitches and tied a knot. It's not the most beautiful way to finish off the back, but I'm going to hang it on the wall, so no one will be the wiser ;) I could have sewn on another piece of felt that came to the edge, and I may still go back and do that. I am really happy with this! I can't wait to do another one. I hope Erin will come out with some trees and little houses next! These dies and more will be available for sale at Papertrey Ink on April 15th, at 10:00 EST! 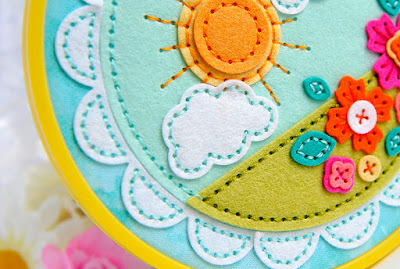 To see all of the fun stitched projects visit the rest of the amazing Papertrey Ink Design team! Your work is soooo bright! Kay! This is BEAUTIFUL. I simply love every single detail! Yes, make another so you will each have one because it's adorable! Everything so perfectly stitched! That scalloped edges finishes it off so nicely,love the way you did the back too! Adorable!!!!!!! This is so pretty, Kay! Oh my goodness! Such a pretty hoop. Love the colors. Your stitching is really beautiful, Kay. 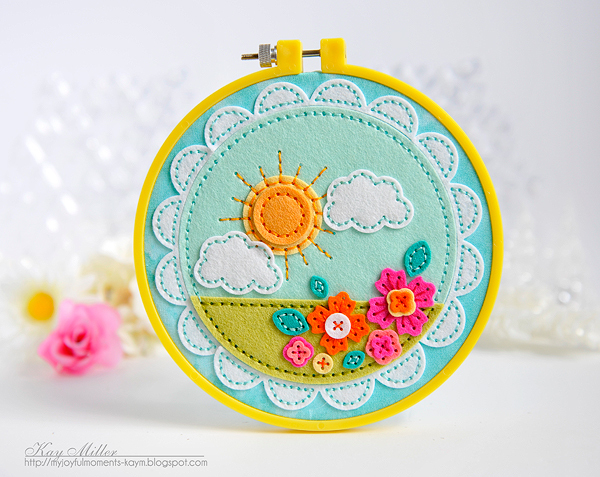 I love the bright sunny colors on your wonderful hoop project Kay! Well, I'm glad you didn't have a wooden hoop, cuz WOW! Bright and bold and beautiful!!! Love how you were kind and gave us your steps:) Especially gluing the scallop first. Thank you! Such an adorable little scene you've put together, Kay! And perfectly stitched of course. PRETTY, PRETTY!! 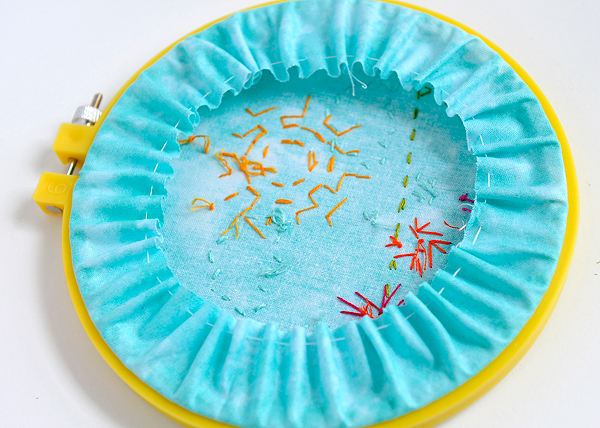 GORGEOUS COLORS AND BEAUTIFUL STITCHES! LOVE IT! Your stitching is so meticulous. Almost like you used a sewing machine. I love the entire design. The flowers really made it. I like your idea of Erin designing trees and houses but I am hoping that she will come up with ideas for Christmas gifts. I have a stamp club that has a special Christmas luncheon and everyone makes something for everyone else. I can just see these as small hoop ornaments or hangings for Christmas. 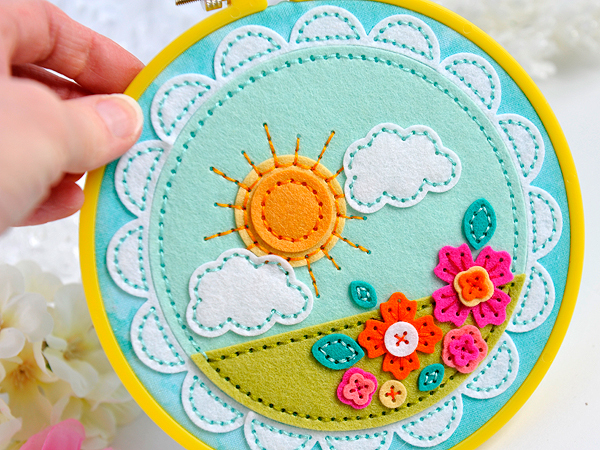 Sunny perfection, I love the yellow hoop with all of the bright colors! Holy Bacalaito (Another Puerto Rican YUMMY fritter)! This hoop is SPLENDID,GLORIOUS,GORGEOUS,AWESOME,DIVINE....wait...it is MUCH MORE than that it's..........SCRUMPTILICIOUS!!!! Girl, you make my heart happy! What a perfectly delightful scene Kay!! I love the scallops too and the yellow hoop worked out well! You have just kept these products out of stock for I don't know how long! That's a compliment and not a complaint. This is absolutely one of the most delightful scenes I've seen in a long time. It just exudes happiness. I'm sitting here with a big, old silly grin on my face. Love this!! Hugs!! Serious perfection on your stitching!. This is so pretty! It would make such a pretty gift!